Are you a “sir up” or a “seeeeeer up”? I’m the former, if that wasn’t already obvious. But any way you pronounce is fine by me. Although, dirty secret – I didn’t like it much growing up. This is probably why I don’t give my husband any crap for not loving it now. 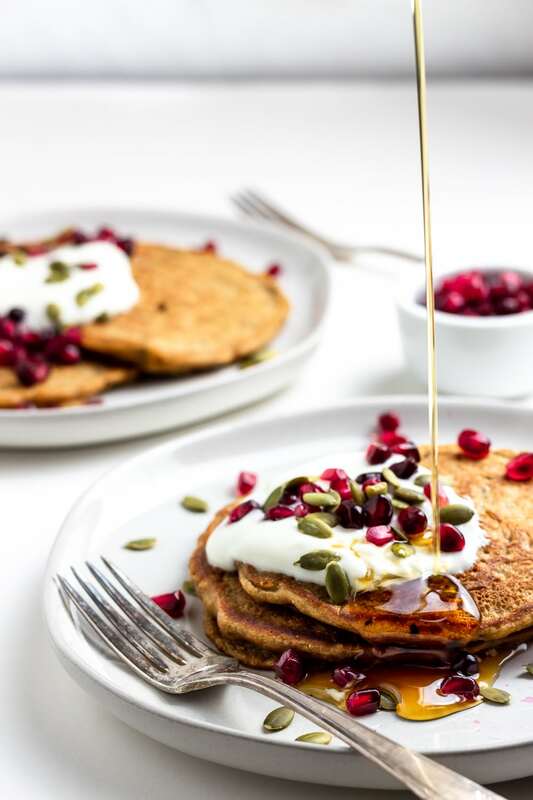 I get it, sometimes you don’t want your pancakes drowning in sticky, sweet, amber deliciousness…or maybe you’re like me and you’ve adopted the “more is more” mentality and simply can’t get enough. ALL THE TOPPINGS, PLEASE! But regardless of how much or how little stuff you might pile a top your pancakes, the pancakes themselves should matter. Something I love about pancakes it that there isn’t just one kind. 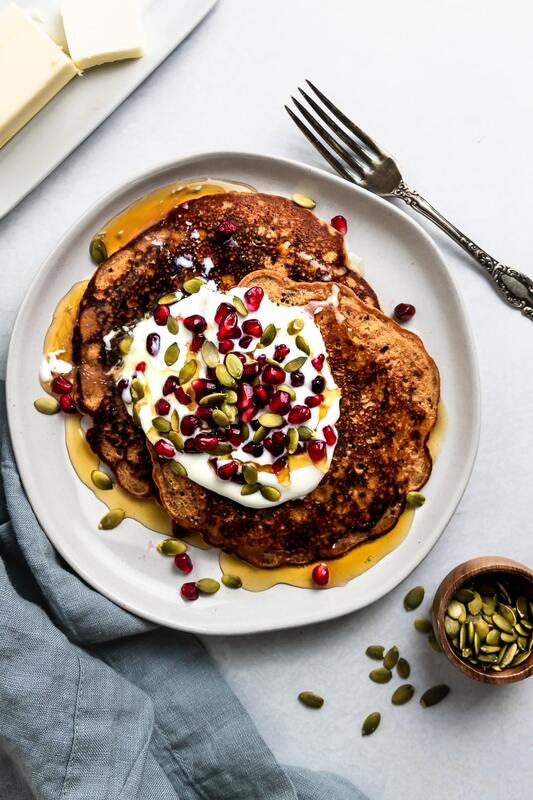 Buttermilk, cornmeal, light and fluffy, thin and lacy, crisp at the edges, soft in the middle, drenched in syrup, slathered in fruit, even studded with veggies – there’s a pancake for every mood, meal, and person – not to mention the countless other varieties around the world. Alright, I get that this is starting to sound a bit like a 6th grade social studies film strip (remember those? God I’m old). But seriously, there are just so many! 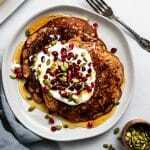 So in the name of adding to an already over-saturated market, here’s yet another recipe for pancakes. But you know what? I bet you’re not complaining (and if you are, well there are a ton of cat videos you could be watching instead). What makes these pancakes different? Well, we’re not reinventing the wheel here. These are clearly recognizable as pancakes. 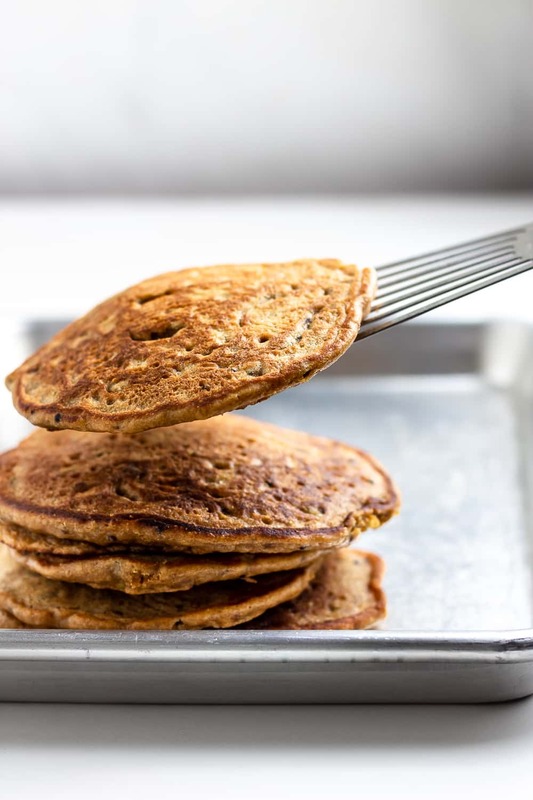 But what makes them different from your standard issue flapjack is on the inside – health from whole wheat flour, heartiness from cooked grains, and earthy sweetness from molasses and maple syrup. Yes friends, the syrup is INSIDE THE PANCAKE. But don’t think that means you can’t put more on top, because I would never do that to you. 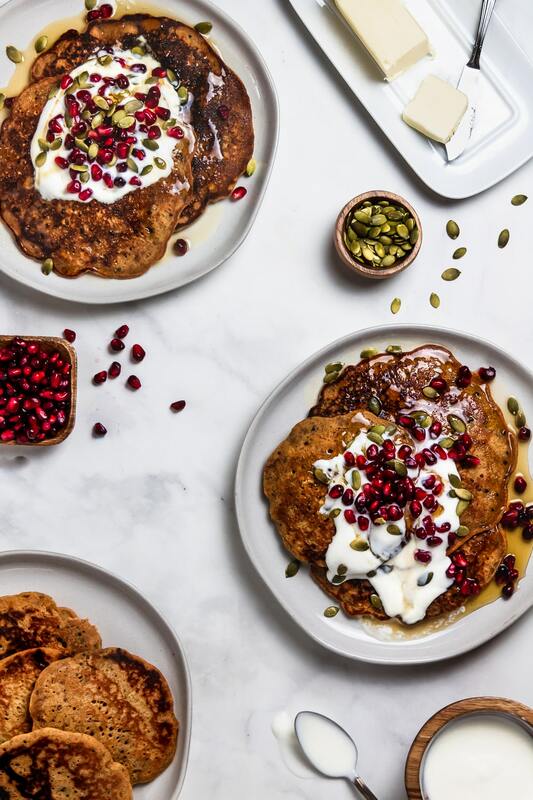 These pancakes are a hearty, healthy start to your day, and even better than that, they’re an excellent way to pack in some nutrients and clean out your fridge at the same time. Cooked grains and seeds give these a punch of protein, nutrients, and amazing texture to boot, and you can use whatever kind your little heart desires. How to make the best pancakes? Yes, these pancakes do have their own special flair, but at the end of the day they still come together in about the same way. That being the case, there are a few tricks to keep in mind for these, or any other batch of pancakes you might flip today, tomorrow, or in the future. Unless of course the future’s got personal pancake robots for every man, woman, and child, in which case this whole thing is probably moot. 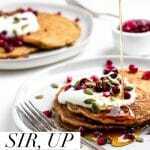 Make sure there is both a little sugar and a little fat in your batter – this will help the pancakes take on that beautiful golden-brown color. Use a non-stick or cast-iron pan or griddle, because have you ever had a pancake stick? It’s very sad. Don’t overmix your batter – you don’t want tough and chewy pancakes. More mixing = more gluten formation and more gluten = tougher pancakes. It’s really just math. I know high heat is fun and all, but medium heat is your friend here – even medium low. You want the pan hot enough for the butter or oil to melt and just barely sizzle, but not so hot that the pancakes burn before they’re ready to flip. And speaking of flipping…the tried and true method that your mom may have taught you back in the day is still pretty good. Wait for bubbles on top and slight drying at the edges. Then flip with confidence and authority – pancakes can smell fear. But if your flip doesn’t work out so well don’t fret. Once you drown them in butter and syrup no one will care what they look like. Well there you have it – another pancake recipe for the books. But I promise you this one is not to be missed, and if you make it, pretty please give it a star rating below. If you let me know you did I’ll hug you next time I see you – unless you’re not into that, in which case I will respect your personal boundaries. Happy pancaking!